Our innovative, multi-story pods have added a whole new dimension to Custom Touch Homes, allowing us to build large-scale, multi-level structures such as hotels and dormitories. 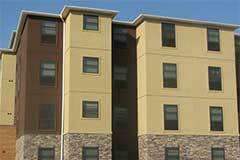 The modular dormitory buildings can be used in a number of different ways, from student housing to military barracks, the prefabricated dorms from Custom Touch Homes are a fast, affordable housing solution. Whether you are developing a completely new lodging structure or simply adding to an existing building, we can customize any floor plan to meet your needs, while maintaining the aesthetic look and feel of your organization.